Whomp whomp. There're no Dr. Daniel Jackson 12" Cloth Figures for sale. 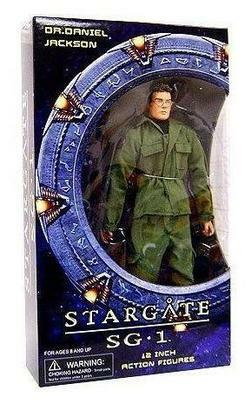 Second in an all new line of twelve-inch action figures based on the hugely successful sci-fi series, this Stargate SG-1 Daniel Jackson figure is ready to step through the gate and explore your collection! Sculpted by Bill Mancuso, this follow-up release features 24 points of articulation and an intricately detailed cloth costume complete with series-accurate accessories! The brilliant Dr. Jackson has saved entire galaxies, so don't miss your chance to add him to your crew!